Martian outflow channels run for thousands of kilometers, are tens to hundreds of kilometers wide, and can be a kilometer or more deep. The largest is Kasei Valles, about 3,500 km (2,200 miles) long, 400 km (250 miles) wide, and 2,500 kilometers (1.55 miles 8,200 feet) deep. (In length, Kasei would stretch across the United States from St. Louis, Missouri, to Los Angeles, California.) 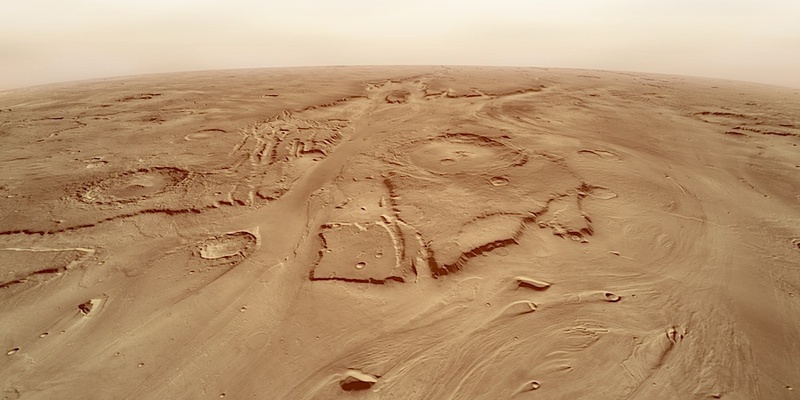 In all, Mars has at least two dozen outflow channels that scientists have identified. 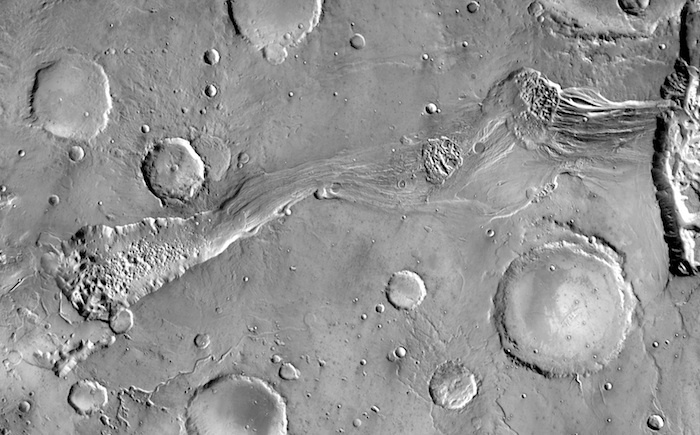 Outflow channels formed primarily in the Hesperian, the middle era in Martian geologic history. Scientists think it lasted from about 3.7 billion years ago until roughly 3.0 billion years ago. Some outflow channels in Elysium and Amazonis, however, show crater-dated ages of a few tens of millions of years. If true, these particular channels are geologically very young. Size makes outflow channels distinctive, but so do the features they contain. The bed of an outflow channel, for example, has streamlined islands, lengthwise grooves, terraces, dry waterfalls (cataracts), and scoured sections. Such features point to massive erosion by catastrophic floods. For an Earth-based example, scientists look to an area called the Channeled Scablands in eastern Washington State, Idaho, and Montana. The Scablands began when a glacier blocked the Clark Fork River in Montana starting about 15,000 years ago. The glacier dam backed up a lake that held about as much water as today's Lake Erie and Lake Ontario combined. Then the ice dam burst. The whole lake drained in a couple of days, sending an 80-mile-an-hour flood that poured westward, carving a path until it reached the Columbia River in Washington and finally surged out to sea. The same catastrophic flood recurred perhaps 40 times over the next 2,000 years. What ended the floods was the final retreat of the glaciers at the close of the Ice Age. The channels in the Scablands show giant ripple marks, deep scours to bedrock, dry waterfalls, and "underfit" modern streams. These last are small streams flowing today in big valleys carved by much larger flows of water. The Scabland floods were impressive by any standard. Yet the flood (or floods) that carved Kasei Valles eroded a far larger and longer channel than any similar one on Earth. So for Mars, the question arises of where all the water to power such floods might come from. Scientists studying the channels' origins find that no single type of source explains every outflow channel. Some channels originate in "chaos regions." These are jumbled areas where scientists think groundwater broke out of the subsurface, perhaps due to tectonic faulting or volcanic activity. As water emerged along cracks, it undermined the ground, widening the cracks into canyons, and leaving mesas standing between. Scientists call this process sapping. Another source, similar to what made the Channeled Scablands, could be the bursting of a natural dam holding back a lake. Scientists see evidence in layered sediments for large lakes fed by groundwater in the canyons of Valles Marineris. Floods from such lakes could be the source for the outflow channels that emerge from the eastern end of Valles Marineris. Kasei, however, originated in Echus Chasma, a depression about 100 km (62 miles) long and 10 km (6 miles) wide. It ranges in depth from around 1,000 to 4,000 meters (3,000 to 13,000 feet). Echus lies next to the closed depression Hebes Chasma, but the two appear separate. Whatever caused groundwater to burst out of Echus, the resulting flood or floods gave Kasei the same kinds of features seen in the Channeled Scablands. Behind such lakes and sudden floods, scientists have a working hypothesis: the idea of a cryosphere. This is a global layer of ice-rich frozen ground that extends from near the surface down to some depth. The hypothesized depth varies from about 2.5 kilometers (1.5 miles) near the equator to about 6.5 km (4 mi) in polar regions. The frozen ground would lock up water (as ice) in the rocks' pore spaces, and it could also cap a deeper layer of liquid water. Thus the cryosphere would act like the top on a bottle of soda. But if something melts the subsurface ice or "pops the top" on the cryosphere — perhaps through faulting or volcanic activity — a lot of pressurized groundwater will come gushing out.